Have a question on Ninja ZX-10 RR? Ninja ZX-10 RR is available in 1 different colors - Green. Homologation specials open the world of racing to us everyday folks. Often produced in limited numbers to satisfy racing rules, these special vehicles bring technologies only ever seen on race bikes to road-going vehicles. Kawasaki has been ruling the world of WSBK for the past few years. The ZX-10RR gives Kawasaki fans the closest opportunity to ride that same bike. 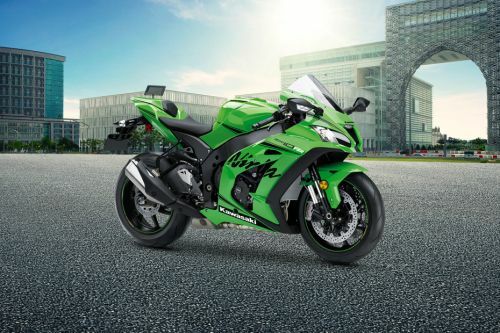 This is the 2016 version of the ZX-10RR and while there is now a 2019 version on sale, it has not yet arrived in Malaysia. The bike had a limited run of just 500 bikes and is sold for a price of around RM 100000. If you do not want the Kawasaki then you are looking at the Aprilia RSV4, Ducati Panigale V4, and BMW HP4, all of which are more recent and more expensive than it. So, what is it that makes the ZX-10RR so special? Let’s find out. From the looks of it, the Kawasaki ZX-10R is indistinguishable from the ZX-10RR. But look a little harder and the differences will slowly reveal themselves. But not from the front. The same curvy dual headlamps with a larger windshield and the central air scoop with the LED pilot lamp between them appear on both the bikes. From the sides, however, the differences start to emerge. First of these are the wheels. The ZX-10RR is equipped with lightweight 17-inch 7-spoke multi-directional forged aluminium Marchesini wheels. These are then fitted with 120/70 and 190/55 Pirelli Diablo Supercorsa SP tires front and back. The bike itself is pained in the Winter Test black paint scheme that adds special snowflake logos on the tail section and the base of the windshield. Like any other self-respecting race bike, this comes with only one seat. Otherwise, to identify it correctly you must look for the special machined RR logo on the engine cover. Or the key for that matter. Everything else – from the revised fairing, titanium exhaust, to the LED tail light and the mirror mounted front indicators – have been carried over from the regular ZX-10R. The dimensions have also remained unchanged at 2090 mm (L) X 740 mm (W) X 1145 mm (H). The instrument display has also made the shift unchanged. It features a curved tachometer going over a a rectangular LCD panel with various readouts. The system would have looked good in 2016 but with so many bikes using TFT color screens, it just looks dated. It also does not include any data logger which is sure to be missed on something meant to be driven on racetracks. Additionally, the fact that almost all these parts can be bought as additional kits somehow makes the bike feel a little less special. The ZX-10RR uses the same aluminum twin spar frame along with a WSB developed Showa Balance Free 43 mm inverted fully adjustable front fork and horizontal back-link fully adjustable BFRC lite gas charged rear shock with piggyback reservoir. Also equipped is an Ohlins electronic steering damper. The suspension settings have been fiddled to accommodate the new lightweight wheels which results in much lighter handling. This however, has not sacrificed the ride quality that remains just as plush as the road bike. The 206 kg bike is very easy to ride thanks mainly to the lightweight wheels and the superior rubber. This makes it capable of going toe to toe with super stock bikes without modifying the bike any further. But the bike does lack the electronic suspension that can be found on the newest superbikes. The engine used in the ZX-10RR is very much like the one in the ZX-10R. It does come with a reinforced and more rigid crankcase and modified cylinder head for extra clearance to accommodate high-lift cams that come with the race kit. Also included are diamond-like carbon coated valve tappets for higher performance. The engine otherwise is the same 998 cc DOHC liquid-cooled inline four with four valves per cylinder. Fuel injection is through 47 mm throttle bodies with dual injection. It produces 197 hp at 13000 rpm and with the help of the ram air intake, this goes up to 204 hp. Maximum torque is rated at 113.5 Nm at 11500 rpm. The bike also comes equipped with a quick shifter and an auto blipper on top of the ZX-10R’s launch control, engine braking control and 3-way power mode. The transmission uses a 6-speed close ratio cassette style gearbox. The engine climbs revs just like the ZX-10R but now comes with a new ECU mapping and race kit that gives it a stronger mid-range. Even this bike comes with Kawasaki’s eco indicator and the fuel tank has a 17 L capacity. The titanium exhaust is alive with sputters and crackles thanks to the ECU mapping and adds some extra character. Braking is top notch on this bike. There are dual 330 mm Brembo front discs with Brembo M50 Monobloc opposed 4-piston calliper and a 220 mm disc on the rear with a single bore pin-slide calliper. There are plenty of rider aids too. Traction control with 5 settings and IMU and ABS make cornering and braking much safer. For the ultimate racing motorcycle experience, the Kawasaki ZX-10RR comes very close to the real thing. It does miss out on some of the more modern electronics and equipment but everything else is all here. Having a higher spec engine in production allows Kawasaki to run a more powerful bike in WSBK and allows racing teams to wring the engine without having to pay through their noses for a race bike. For the rest of us, the ZX-10RR can be the race bike with headlights and a number plate that we always wanted. What are the Safety Features Available in Kawasaki Ninja ZX-10 RR? Is Kawasaki Ninja ZX-10 RR available in Electric?